This provocative, wholly satisfying novel is a Western adventure told in the language of magic realism. It skillfully blends historical insights, moments of fantastical humor, stories of travel through exotic climes, and references to European poetry, Homeric mythology, and even Oedipal psychology. 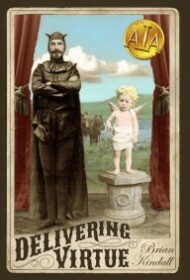 The story opens in Independence, Missouri in 1854, where Didier Rain struggles toward sobriety following “an epic bout of debauchery.” Somehow, in his depleted state, he manages to obtain a contract to deliver an infant girl to a settlement of breakaway Mormons in Utah, where she has already been committed to an improbably arranged marriage. Thus begins a picaresque story told by Rain himself. First appearing to be an aimless layabout, he is full of surprises. Unexpectedly fluent in a variety of languages, he gradually reveals depths of learning that first appear in casual asides: quotes from Shakespeare and English Romantic poets, along with offhanded mentions of Hieronymus Bosch and the lagoons of Venice. So unusual is he, in fact, that the author (as an in-joke perhaps) has him quoting T.S. Eliot many decades before that poet’s birth. Eventually, he reveals a past even more tangled than the present journey, partly justifying both himself and the misanthropic cynicism he often displays as the tale meanders along. Author Brian Kindall delivers it all with crisp dialogue, well-developed characters and a steady, relentless pace. He expertly juggles a multitude of elements in a story marked by violence, human frailty, natural hardship, and religious excess — all finally and surprisingly redeemed by love. While the story is focused mostly on Virtue, the infant who miraculously grows to young womanhood in the course of the journey, there are contributions along the way from an Indian maiden they encounter and even from the horses they ride. By its end, all the revelations, disclosures, surprises and their aftermath bring the novel to a gratifying and rewarding end. If it raises more questions than it answers, the questions are surely worth the asking.